Ready to be “Dunn” in the sun?? Dunn Inn 2 is the perfect spot for your next vacation! 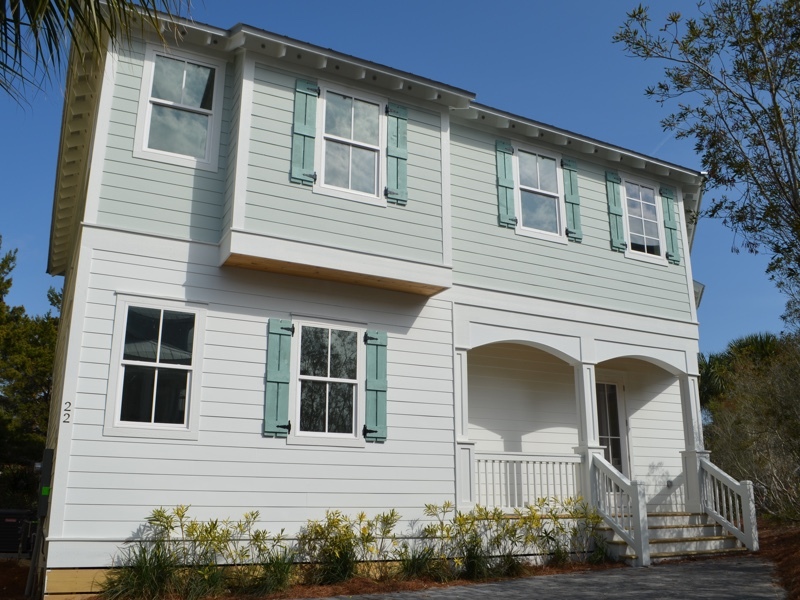 Dunn Inn II is located in the Seacrest Beach resort, so after you have enjoyed your day at the massive Seacrest Lagoon pool just a few blocks away or the gorgeous Emerald Coast, come home and relax in this brand new 5 bedroom home. It is perfect for multiple or large families. Dunn Inn 2 comfortably sleeps 8 adults and 9 children. Walking in through the front door, you enter the giant great room and open dining area and kitchen. The kitchen is all high end stainless steel appliances, granite counters and a breakfast bar which seats 4. Our dining room table has seating for 8 along with a bench along the windows in the living area that will also have a table seating 4. The living area is beautifully furnished with a large sectional sofa and has a gas fireplace with a 65″ TV above and a DVD player. A great entertaining bar/wine area makes this floor plan the perfect gathering place. The 1st floor has two bedrooms. One features a King bed, private bath, 43″ TV, and two built in bunk havens each with a 24″ TV. The other bedroom features a Queen bed with a 43″ TV, and it has an entrance into a full bathroom with tiled walk in shower. This bathroom also has an access from the hallway. Heading up the stairs you’ll enter the giant living room/playroom with an awesome oversized sofa. We’ve included a 60″ TV on the wall for all of your gaming and viewing needs, and there’s a DVD player for movie nights. Located just off the playroom is the bunk room with 7 beds! This room includes a 42″ TV on the wall for the kiddos with a full bath just outside the door off the hallway. There is a separate entrance to the Queen bedroom upstairs located just across from the playroom. This room features its own full bathroom with walk-in tiled shower (and 43″ TV). And finally, the HUGE master bedroom with a fitting huge walk in closet. The master has great windows and an immaculate private bath featuring a stand along bathtub, two separate vanities and a tiled walk-in shower. The master has a 55″ flat screen TV. The deck off the living area is a great place to relax after a day in the sun. There’s a gas grill for your cooking needs. Grab some local seafood and enjoy a night in! Come to Dunn Inn 2 to experience all that Seacrest Beach has to offer. Easy ride to the beach on the free shuttle/tram service during peak season and all the sun & fun you need at the Lagoon pool. Seacrest is located just steps from Rosemary Beach and Alys Beach surrounded by all the shopping and great eateries you can handle. Dunn Inn 2 is an easy walk to 30a, so many shops and restaurants are a bike ride or short walk away! Bunk room with 7 built in bunks!